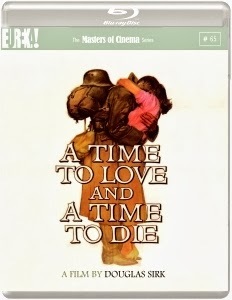 The latest work from German auteur Douglas Sirk to get the Masters of Cinema treatment (following the rerelease of The Tarnished Angels earlier this month), 1958’s A Time to Love and a Time to Die is remarkable not only for its sympathetic portrayal of disheartened and disenfranchised German soldiers towards the end of the Second World War, but also for its fine blend of sharp humour and sweeping CinemaScope melodrama. Starring John Gavin and Liselotte Pulver as the lovestruck Ernst Gräber and beautiful Hamburg resident Elisabeth, this is Sirk at the height of his Hollywood power. Returning home to the burnt-out remnants of Hamburg after several long, cold years on the Russian-German Front, Gavin’s square-jawed Gräber comes back to a city in ruins. With his parents’ apartment block completely destroyed by enemy bombing raids, Gräber frantically searches the note-littered wall of the district to find some trace of his beloved family. Consequently, our young hero meets and falls in love with the feisty Elisabeth, the charming daughter of his parents’ former doctor, who has also disappeared, presumed dead. As the couple struggle to forge a new life together amidst the detritus of a seemingly endless, apocalyptic conflict, thoughts of Gräber’s inevitable return to the front-line loom ominously over the lovers. Sirk’s vibrant adaptation of Erich Maria Remarque’s novel flits effortlessly between high art and high drama, perfectly tailored for both hardened cinéastes and old-fashioned romantics alike. Beginning with the mass execution of a group of Russian innocents, A Time to Love and a Time to Die certainly doesn’t shirk away from depicting the true, cruelly detached nature of modern war. And yet, Sirk’s epic drama is also full of great warmth and wit, particularly in the scenes featuring the superb Keenan Wynn as gout-afflicted German gent Reuter. The supporting cast all perform admirably and there’s even an early appearance from a one Klaus Kinski, who would later help usher in the New Wave of the 1960s-80s. As with any Sirk melodrama, however, A Time to Love and a Time to Die inevitably comes to hinge upon the on-screen chemistry between its two love-struck leads. Fortunately, audiences were/will once again treated to yet another masterclass in romanticism, as Ernst and Elisabeth’s potentially blissful future is briefly glimpsed before being tragically snatched away in a cruel, almost trademark twist of fate. Along with several different viewing options, courtesy of this brand new MoC rerelease Sirk enthusiasts can also enjoy numerous expert analyses of the celebrated filmmaker from the likes of Jean Luc-Godard and Cape Fear screenwriter Wesley Strick.